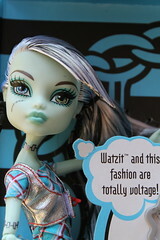 As I mentioned previously, I decided to order some Monster High dolls from Popfuzz‘s ebay store. While I normally prefer to buy my MH dolls in person, I’ve gotten a bit tired of the continual hunt for new dolls, I ran through two tanks of gas running back and forth to different toy stores last week so from that perspective it just seemed more cost effective to give up and just pay for shipping. Honestly, I’m starting to think the hunt is a bit overrated in general and may just make Popfuzz my primary Monster High resource (I’m not going to completely rule out my picking them up at a store if I am there anyway). Anyway unto the dolls, I got the new Day at the Maul set of Frankie and Draculaura dolls. 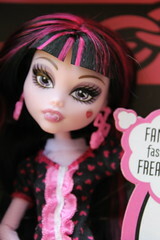 The Day at the Maul line is a little different, it is available both as a fashion pack or as dolls. 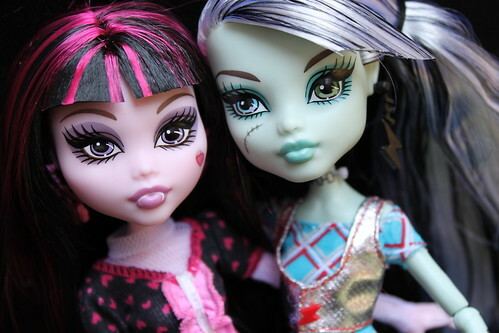 The dolls are basically just redressed Gloom Beach versions of the characters, sure Frankie’s hair is a bit different but the face ups are the same. 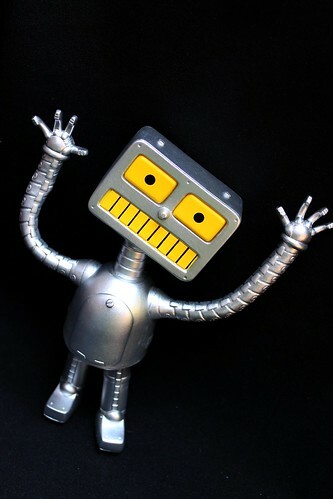 In addition to the Monster High dolls I also got the exceptionally awesome Popfuzz vinyl robot. Frankie comes with a Watzit key chain. She does not come with any new diary chapters unlike the School’s Out version of Frankie but as I, myself do not really read the diaries it doesn’t really bother me. Draculaura comes with a Count Fabulous keychain. Again she doesn’t come with any further diary entries, the continuation of her diary comes in the Clawd/Draculaura two-pack. 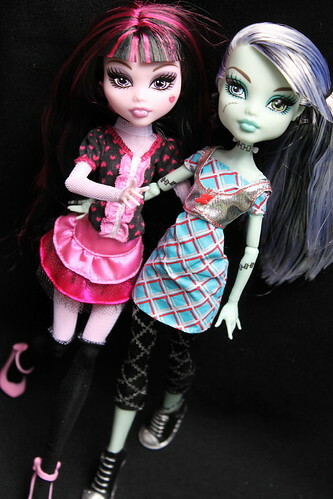 Both dolls are pretty cute, they really look they are ready for a day of shopping fun. I actually like the way they released these both as a fashion pack and as dolls, I like to have options and honestly I probably would have ended up buying another set of the two GB dolls just to put the outfits on anyways (I ended up buying a doll for each of the other fashion sets with the exception of Deuce eventually). 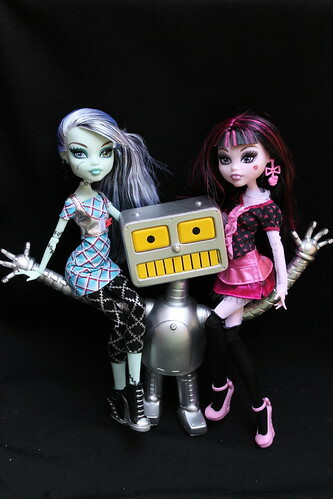 To me, Frankie really kind of outshines Draculaura in this release. Nothing is wrong with Draculaura, she’s cute but to me Frankie is much cuter. 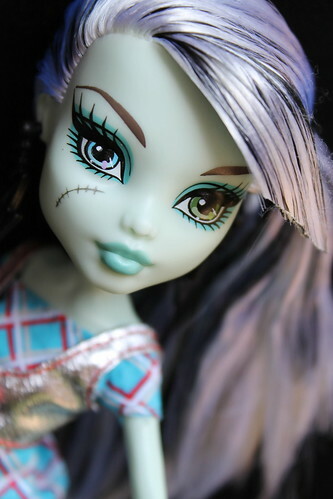 I absolutely love Frankie’s hair although I admittedly love this Frankie doll in general. Her outfit is really cool, it really suits her wonderfully and the hairstyle just kind of makes it perfect. I like this Frankie a lot more than the School’s Out Frankie. Frankie seems especially fond of her new robot companion. 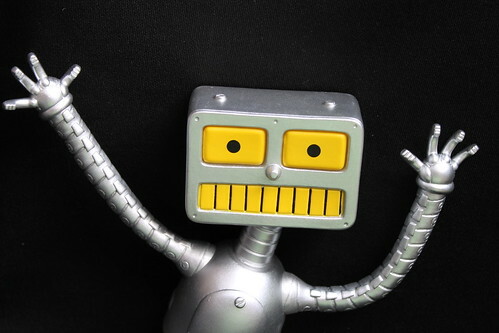 Popfuzz the Robot is a limited edition vinyl toy, he is limited to only 350 and is exclusively available at Popfuzz. He has been released in a variety of different paint jobs including a do it yourself model as well as a glow in the dark model. 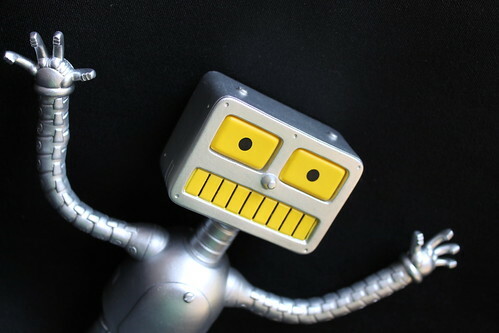 I’ve a great love of robots and this little guy is pretty darn cool, unlike most vinyl figures he is somewhat poseable his head has a pretty good range of mobility and his arms even move somewhat. I want to take him some place cool to photograph him but I need to think a bit more industrial than my normal places to suit him, I think. This entry was posted in 2011- 365 Toy Project and tagged day at the maul, draculaura, frankie, frankie stein, monster high, popfuzz, robot, vinyl toy. Bookmark the permalink. The heads themselves are not actually wider, with Draculaura in particular sometimes the eyes are just painted closer together. It’s becoming increasingly common with Draculaura, I’m not the biggest fan of it myself as it makes her face look a bit too fat imo. Hunting for these dolls truly is a pain! it took me two weeks of running around to finally found spectra vondergeist, and when I found her it was at wal mart while grocery shopping. They only had one left! I’m glad I got a hold of her though.